The Rub Club is a Massage Program within Belde Chiropractic which offers a variety of massages either individually or in a package. The Rub Club requires a signed agreement stating rules to abide by while using the club. 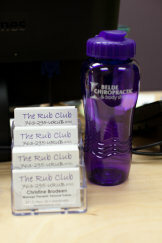 The Rub Club is often used in conjunction with chiropractic as an integral part of soft tissue injury cases. We are proud to offer affordable massage therapy performed by trained and experienced therapists in a comfortable, convenient and safe atmosphere. Reimbursement through pre-tax accounts is typically available with a referral letter from our doctors.